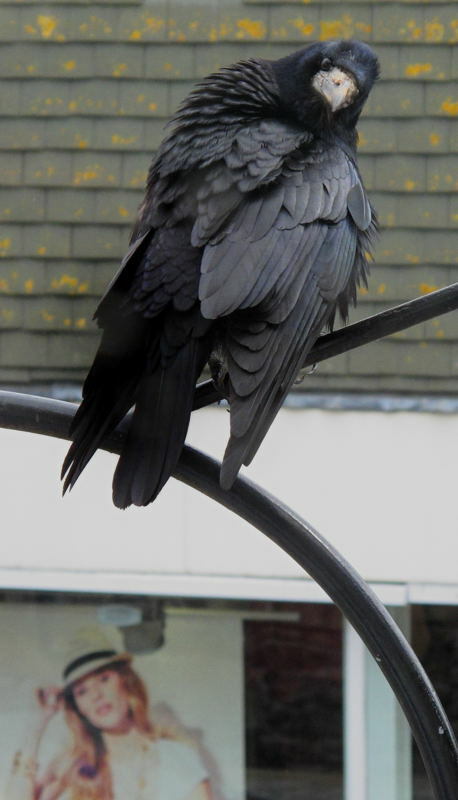 Rook preening on a street lamp in the main street of Penzance, Cornwall; 25 Apr 2012. We were sitting at a table on the upper floor of a café, enjoying the interesting and lively view over Penzance’s main street. Two Rooks came and perched on street lamp brackets immediately outside the window. I had a feeling they wouldn’t stay there long, and so rather than reaching for the Nikon, I used the little G11 which was already in my hand. One of the Rooks left almost immediately but I managed to train the Canon’s telephoto onto the other bird which, despite all of the hustle and bustle in the street below, started preening. Rooks are crows, and more usually birds of the open countryside. I like crows anyway, but noisy colonies of these birds – rookeries – in the tops of tall, rural trees are for me one of the great joys of spring. So seeing them here above this busy shopping street was a surprise, albeit that Penzance is not that large a town. And having the bird set against the window display of the shop on the other side of the road added to that. Technique: Canon G11 PowerShot at 140mm (equivalent); 400 ISO. Upstairs in The Victoria Tea Room, Penzance, Cornwall; 25 Apr 2012. We returned yesterday from a few days in the far southwest of Cornwall, based between Penzance and St Ives. And in a week of awful weather all over England we were far enough southwest to miss it all – it only rained at night, and the days were dry and even sunny! Whenever we’re in Penzance we always visit this tearoom. Amongst many other tasty goodies it serves up 11 item English breakfasts – which I hold a profound reverence for – and we like to sit beside the windows upstairs, looking out over Penzance’s main street. 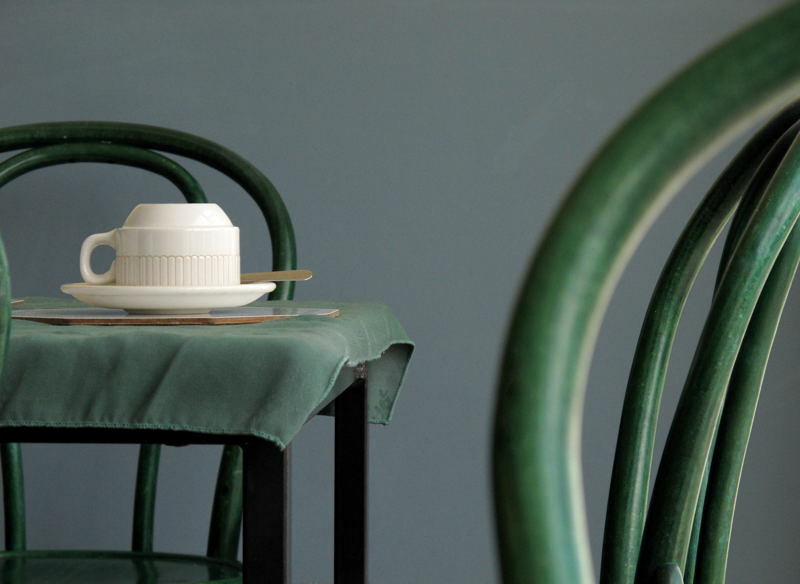 In this cafe there are many bentwood chairs in a beautiful green, and the place has an over all low key, Minimalist, green and grey decor that I like very much. This cup and saucer provided a good foil for its low key surroundings, and the chairbacks on the right resemble the curving stems of some exotic plant. The first post in this series on chairs, which contains context and an image, can be found here. Subsequent posts are here: 2 3 4 5 6 7 8 9 10 11 12 . 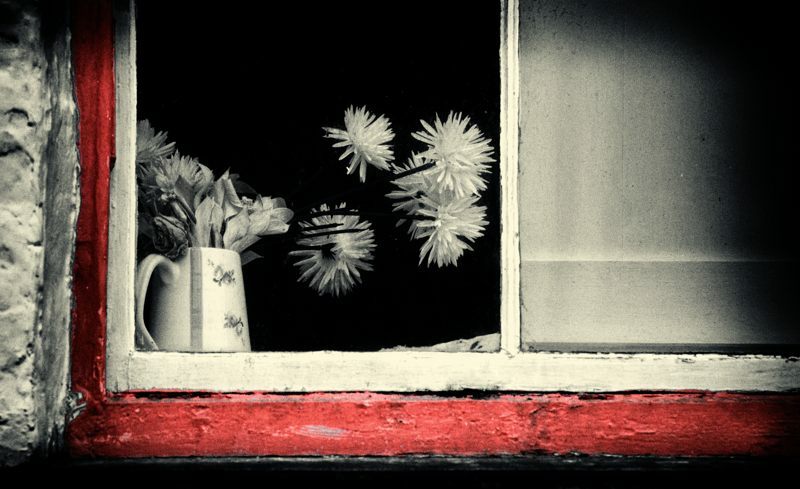 Each will open in a new window. Click onto this image to open a larger version in a separate window. Technique: Canon G11 PowerShot; 400 ISO. UPDATE: this excellent eatery has closed down – a great loss. And while I’m talking about this image – I can say that its a great favourite of mine. I have always loved its vast simplicity. 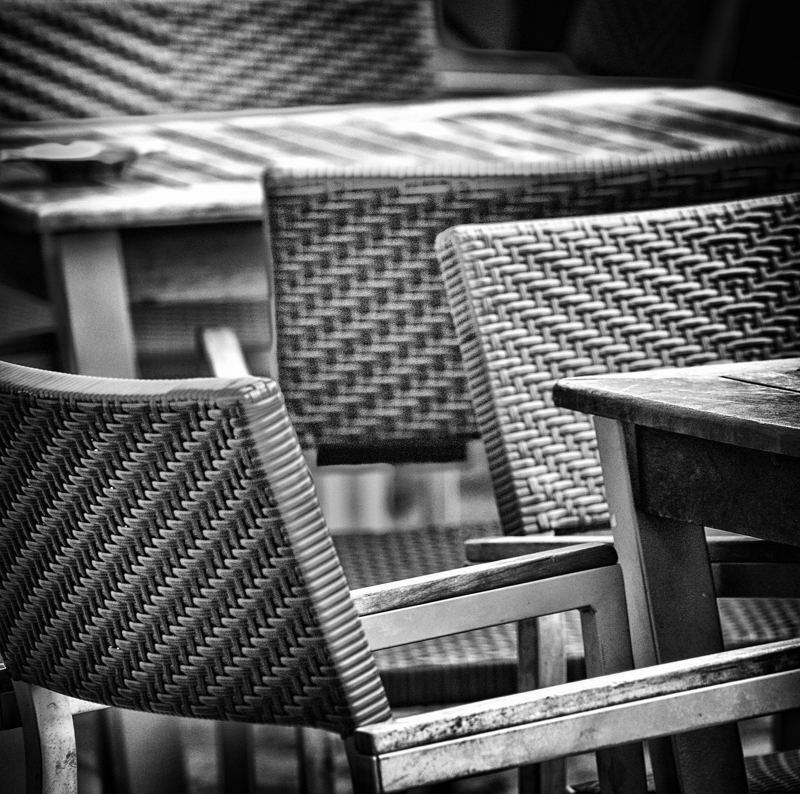 Tables and chairs outside a cafe in Penzance, Cornwall; 25 Apr 2012. I love the abundance of shapes and textures here, and the fact that none of the objects is portrayed in its entirety. I remember reading about some artists’ liking for truncating objects with the frame and I think this a powerful tool – for use even with portraits. The first post in this series on chairs, which contains context and an image, can be found here. Subsequent posts are here: 2 3 4 5 6 7 8 . Each will open in a new window. Click onto the image to open a larger version in a separate window, then click onto that image to enlarge it further. Technique: D700 with 70-300 Nikkor lens at 300mm; 1600 ISO; converted to mono in Silver Efex Pro 2. Penzance, Cornwall; 8 Oct 2013. Technique: D800 with 70-300 Nikkor lens at 300mm; 400 ISO; Silver Efex Pro 2’s Film Noir 1 preset, with selective restoration of colour. Mannequin in a shop window, Penzance, Cornwall; 14 Sept 2011. We were in Penzance on a brilliantly sunny day and potential pictures were all around – I’ve already posted some here. 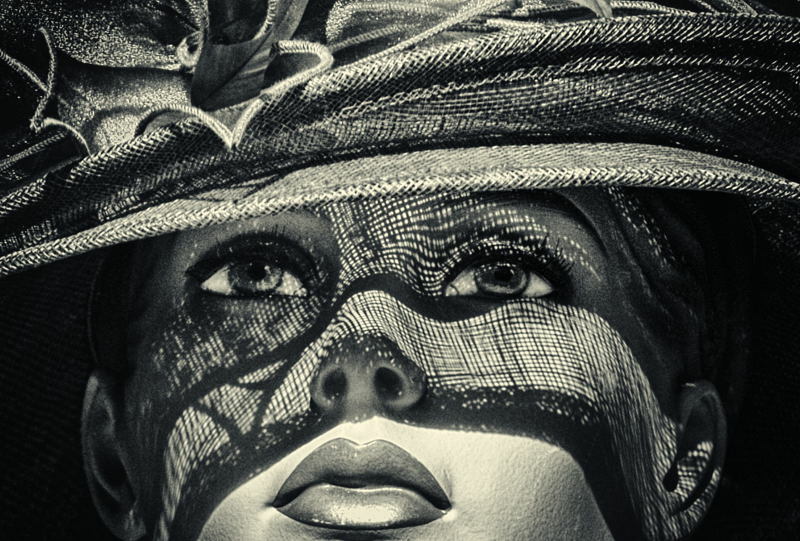 This dummy was in a window facing straight into the blinding glare, and the combination of her extravagant hat and the patterns that the rim of this hat spread over her blankly staring face drew me towards her. Post-capture, I thought of enhancing the whites of her eyes but decided that they’re ok as they are. Technique: D700 with 70-300 Nikkor lens at 300mm; 400 ISO; converted to mono in Silver Efex Pro 2. UPDATE: after all this time, still very much amongst my very favourite images. I’ve found that to be a thing about blogging – I post an image that I’m (nearly always!) totally enthusiastic about at the time, but I’ve noticed that attitude can change over time, so that sometimes I can look back at past posts, and either think their images simply ok or, then again, not really that good. But then there are the images that, old as they may be, I still feel really good about – and here is one. And this is a healthy process, I think, probably one that we all do – we change over time, our visual perceptions and tastes change over time, we are moving on. Drinks can on stairs in Penzance, Cornwall; 14 Sept 2011. Inhibition is a strange thing – and most often something which I refuse to give in to. After all, doesn’t that song from The Rocky Horror Picture Show say something like “Do it, don’t dream it!’? But I’ve rambled on before about the – as I see it – cardinal sin of digital photography being trying to pass off some highly manipulated colour image as point of capture reality, and that is something I’m quite sure about. 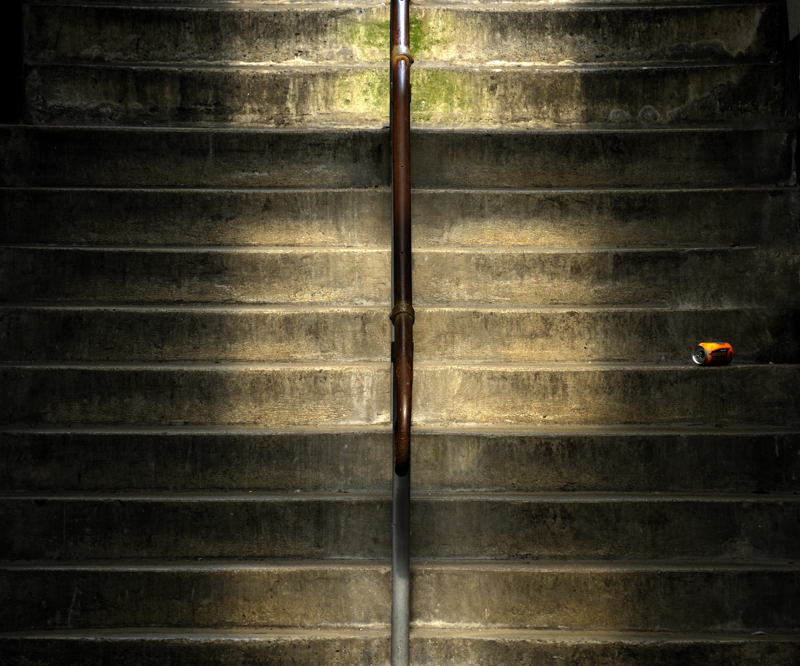 So, here, yes this a picture of a drinks can on partially sunlit stairs in Penzance, but I’ve made the sunlit area much brighter than it actually was and I’ve very significantly increased the bright orange of the can to make it more prominent. I feel better for letting you all know that! This was originally posted under ‘Colour’, and its an example of very little colour helping a picture. The green at top center, the (now) blazing orange can and the deep brown of the handrail are all relatively small items, but remove them and the picture loses something, and presenting it in straight monochrome makes it very featureless indeed – although there may be some potential for a really radical black and white conversion here. D700 with 70-300 Nikkor lens at 300mm; 800 ISO. I’m looking up the busy main street of Penzance. The pavement is set up above the road, up to the right, and the line of stylish black bollards at upper right support railings that prevent carefree shoppers from plunging down onto the hard ground below and spoiling their consumerist frenzies. The road is on the left, and those wishing to cross it must first descend these little flights of steps to get down to road level. The picture looks rugged, and I’ve used SEP2 to intentionally emphasise this, darkening the image somewhat and raising contrast. 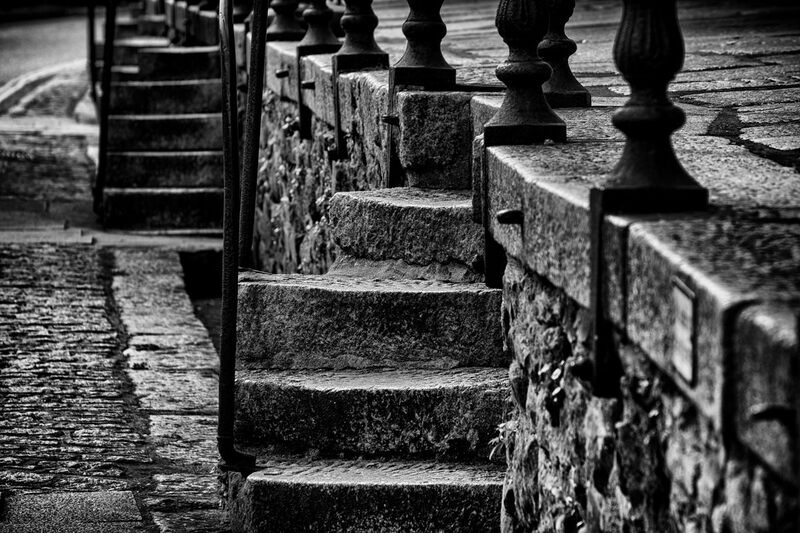 And it is rugged – the pavement, the flights of steps and all of the cobbles along the road’s edge are made of very hard and rough, local granite. To me, this is a scene with character, far removed from our usual bland, plastic and glass high streets. X-T1 with 55-200 Fujinon lens at 305mm; 200 ISO; Silver Efex Pro 2; 22 Sept 2016. Because this photo is approaching letterbox format, it can’t be shown at any great size on this blog >>> therefore, if you get into my blog, I think its better viewed by clicking onto it, when it will open in a separate window. There is a lot of detail to see. 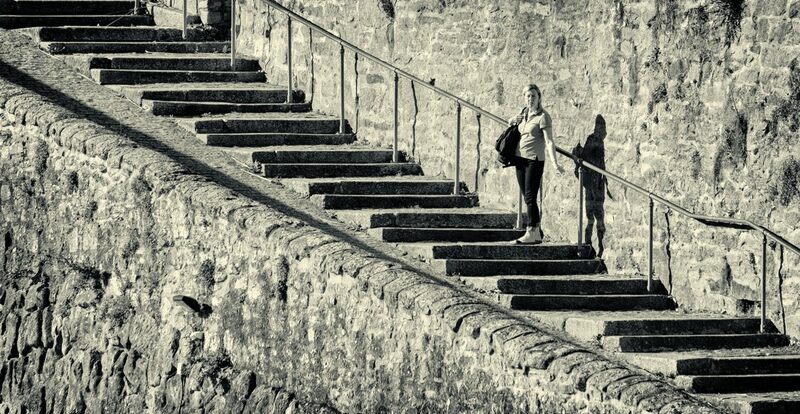 This small and distant figure is momentarily posed part way up this great diagonal sweep of stairs. In front of her is a considerable drop into deep water, while behind her is the sheer face of a high masonry wall. Perched up the air like this – on a stairway to heaven??? – and with this fleeting pose, she was quite striking. Where was this? Well we were walking along the sea front in Penzance, Cornwall, heading out towards the fishing port of Newlyn. 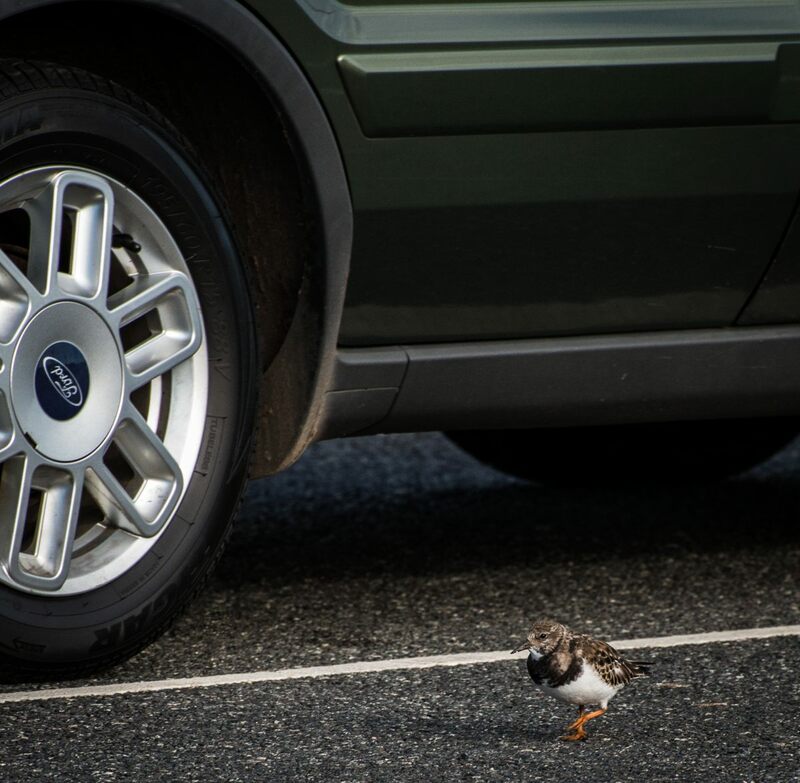 She appeared unexpectedly on our right, starring fixedly in our direction – starring back above our heads it seemed. She was smoking a cigarette, holding it down and away from her, and firing quickly I caught the momentary pose. X-T1 with 55-200 Fujinon lens at 305mm (equiv); 400 ISO; Silver Efex Pro 2; beside the dry dock on the sea front at Penzance, Cornwall; 22 Sept 2016. 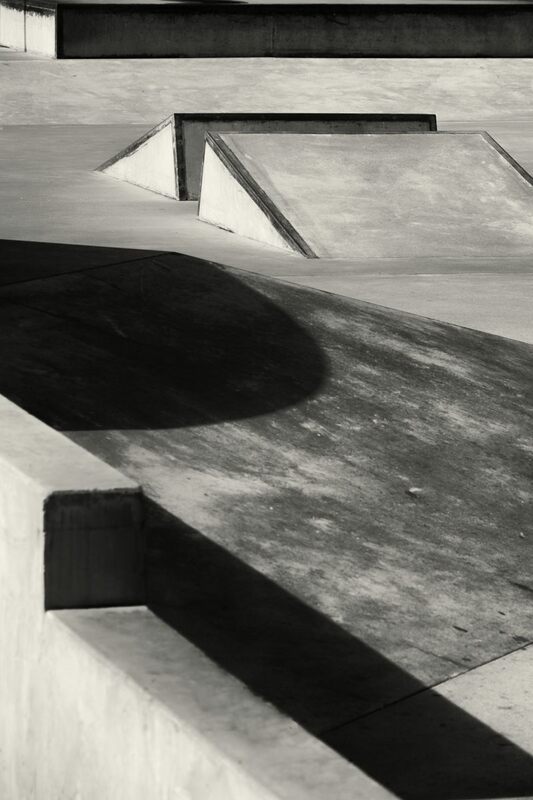 Skateboard park, on the sea front between Penzance and Newlyn, Cornwall; 22 Sept 2016. There are many shapes and textures here, but from ground level it was difficult to make anything of it. Luckily the path ahead led on up a flight of steps, giving the opportunity to look down somewhat on the scene. Having the faintly pale border right at the top of the frame helps put form and bulk to that great, shadowed, rectilinear block of concrete that is there. X-T1 with 55-200 Fujinon lens at 160mm (equiv); 200 ISO; Silver Efex Pro 2.